New article from A.N, a very experienced member in industrial, commercial buildings and residential power installations, testing, control and maintenance. Enjoy and do not hesitate to ask him questions! An arc fault circuit interrupter (AFCI) is a special circuit breaker, outlet or receptacle with the ability to detect, recognize and respond to dangerous electrical arcs in a circuit. The device provides a higher level of protection compared to the standard circuit breaker. Its main advantage is the ability to detect and remove the hazardous arcing before it can cause a fire. Why use an Arc Fault Circuit Interrupter? Electrical arcs exist in most of the common applications. These are usually very small and safe. Examples include the arcing due to plugging in of plugs into sockets, switching on and off of switches, electrical motors and more. These arcs last for only a short time and are usually very small, hence no risk of causing a fire. However, there are other unwanted arcs that may arise due to faults in the wiring, loss of insulation, deterioration of the wiring system, loose connections and more. The two main arcs are the series and parallel arcs; each has its cause and implications. The unwanted arcing can cause fire if not prevented, hence the need for the ACFI. The devices functions like the conventional circuit breakers, however, they have the ability to detect arcing conditions that the normal circuit breakers cannot. The conventional circuit breakers can only respond to short circuits and sustained overloads but not the arcing. Electrical arcing occurs due to a variety of reasons such as when there is inadequate isolation or insulation of the circuit. Most of these are due to faulty wiring, aged facilities, and improperly installed wires such as loose connections. The arc may also occur between the wire with damaged insulation either by heat, aging, impact or kinking. The hazardous arcing occurs when one or a combination of the following conditions is met. 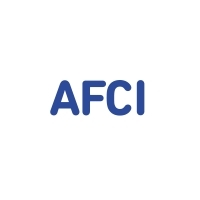 The construction of an AFCI may differ from one manufacturer to another. 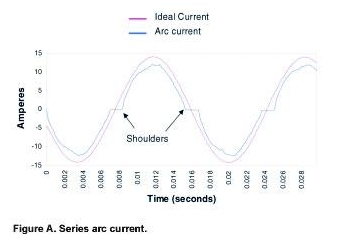 However, the operation involves analyzing the waveform for the presence and the magnitude of the arc, and consequently interrupting the current it the arc is dangerous. The device looks for multiple, simultaneous characteristics and then uses this to determine the presence and persistence of a dangerous arc. The protective devices monitor the electrical waveform for abnormalities in the wave pattern, and if the waveform has characteristics of a lethal arc, the AFCI promptly interrupts or open the circuit to avoid fires or damage. These devices are built with the ability to differentiate between safe arcing from normal use such as switching on and off of equipment and the dangerous arcs that can cause fire or burns. The AFCIs are basically standard circuit breakers with added AFCI function. The devices have the same standard ratings and capable of providing the usual over current and short circuit protection. Most devices include a ground fault detection ability of about 30 milliamps for the added protection and avoidance of nuisance tripping. The AFCI devices have inbuilt functionalities that enable them to identify the distinctive characteristics in current and voltage waveforms that results from dangerous arcing. It analysis the AC waveform and compares any irregularities with the electrical signature of an arc, which usually comprises of a sequence of current spikes and corresponding voltage drops. This is often installed at the outlet of a branch circuit to protect the extension cord and the appliance. These are installed at the origin of the feeder or branch circuit. It provides protection to the feeder or branch wiring. 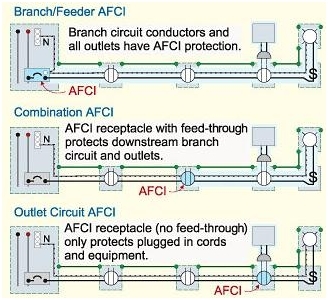 The combination AFCI combines both the features of the OC and B/F. It is designed to protect the appliance cords, extension cords, branch circuits and feeder wiring. This is a plug-in device that is usually connected to the receptacle outlet and has one or more protected outlets. It provides protection to the connected extension cords and appliances. The cord AFCI is a plug-in device that is connected to the receptacle outlet, and often used to protect the connected power cord. 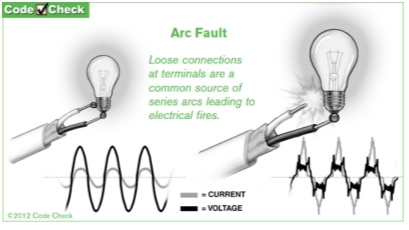 Arcing is responsible of over 50 percent of electrical fires in residential installations. This occurs due to arcs arising from problems in connected equipment or faults in the wiring system. An effective way of preventing these fires is to detect if there are lethal arcs, and then interrupt the current. Even though the normal circuit breakers provide the protection, they do not have the ability to detect the hazardous arcs. The arc fault circuit interrupter on the other hand, provides the same functions as the conventional circuit breaker, but has an advantage of the ability to detect and respond to the unwanted arcing before it causes a fire. or copy this trackback: http://engineering.electrical-equipment.org/electrical-distribution/arc-fault-circuit-interrupter-afci.html/trackback from your own site.